The strategy of the adviser is based on an assessment of the strength of the trend and the finding of correction / reversal points; it compares the absolute values of the rise and fall of the market over a certain time period. The filter is used for time, spread expansion, increased volatility, slippage and day of the week. 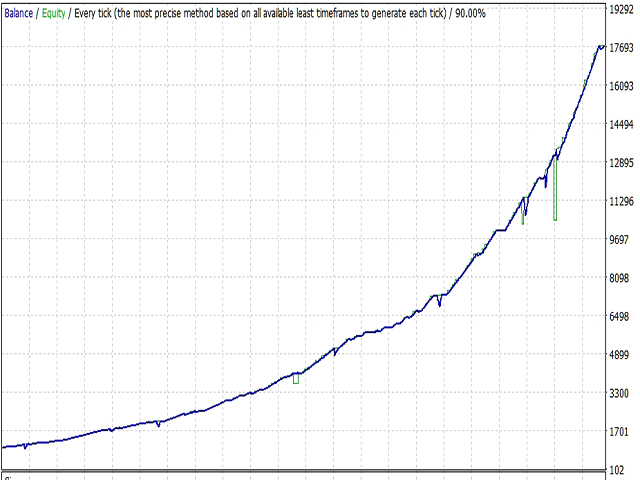 The strategy uses short-term trading - night scalping, not using martingale. Suitable for all brokers, including American brokers with FIFO. All orders are accompanied by a virtual stop-loss and take-profit in pips. The graph displays various information and indicators indicators. The recommended minimum deposit is $ 200 for 0.01 lot. 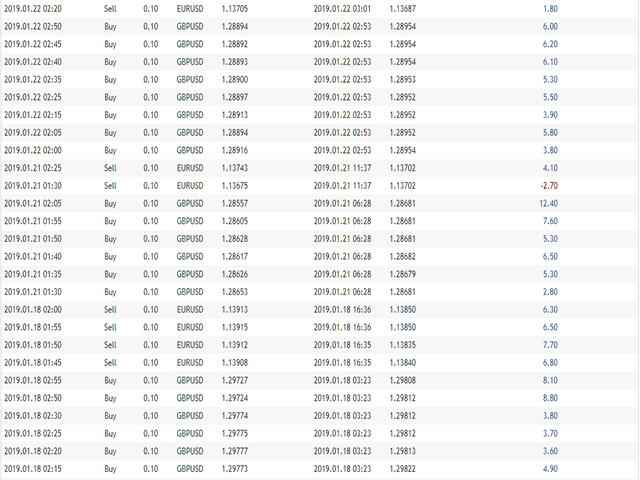 Take Profit set 50-70 pips with a spread of 20 pips. The timeframe is set in the parameters of the adviser, the default settings are optimized for EURUSD. Take profit is initially set from the opening price of the first order. If N is the number of open orders specified in the START_ZEROLEVEL parameter, take profit will be set from the breakeven level. If the number of orders has reached the specified value in START_BREAKEVEN, then the adviser will close all orders in breakeven. If the day of the week is set as FALSE, and there are open positions in the market, the adviser will go into the mode of closing orders without a breakeven, a new cycle of orders will not open. A trading lot is calculated using the formula: Balance / FROM_BALANCE * FIX_START_LOT. START_BREAKEVEN - close all orders in breakeven if the number of orders has reached the specified value. For any questions, write me a personal message or e-mail. I've got very impressive backtesting results and I think it's a great EA. I hope, it will show the same results in real time. Good 2018 back test results using TDS2. Strategy and MM is good. I will update review again after demo for at least 4 weeks with news filter enabled. Love the strategy, and for sure has potential. But using 99.9% quality data it doesn't make it through 2018 with your setfile. Default settings do look more promising for 2018. Doesn't pass any backtest in 2017 forward though..
A helpful tip, if you wish to sell an EA to people. Make sure to use 99.9% quality data. Thanx for the EA. Good results on test. Good job. Ставлю 4 звезды авансом. хотя очень хочется поставить 5 звезд. за интересный подход к созданию этого эксперта автору респект! с момента установки эксперт показывает стабильный прирост депозита с настройками по умолчанию на валютных парах eur/usd и gbp/usd. посмотрим, как будет вести себя дальше с разными брокерами! Hey thanks for the EA. Unbelievable results on the BT(back test) on default settings, very well programmed structure and combination. thanks for your help, I made a signal. Для работы новостного фильтра необходимо: В торговом терминале в меню откройте "Сервис" ---> "Настройки" ---> "Советники" ---> добавить адрес "http://calendar.fxstreet.com" в поле "Разрешить WebRequest для следующих URL". ВНИМАНИЕ! ПЕРЕД ОБНОВЛЕНИЕМ СОВЕТНИКА СОХРАНИТЕ ВАШИ ПАРАМЕТРЫ В СЕТ ФАЙЛ. USE_BALANCE_PCT - процент средств от баланса которые может использовать эксперт на установленной валютной паре. Значительно ускорена оптимизация эксперта - файл оптимизации на странице обсуждения. Значительно ускорена работа эксперта, оптимизирован код и добавлены новые возможности.